Paulist Fr. Frank Desiderio is a native of the Washington, D.C.-area. He attended the University of Maryland at College Park. Fr. Frank made his first promises to the Paulist community on August 12, 1978. He was ordained a priest on May 22, 1982. Fr. Frank has served since May, 2014, as first consultor, or chief advisor, to the president of the Paulist Fathers. He also serves as director of St. Mary's at the Lake, our summer retreat at Lake George, NY. Fr. 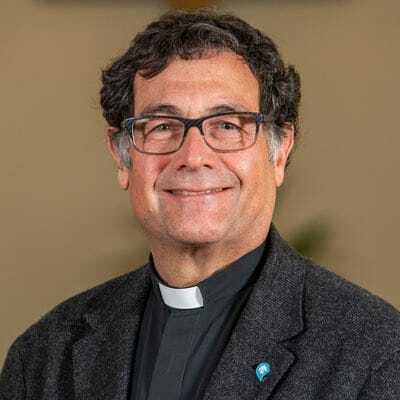 Frank previously served as director of the Paulist Associates; director of the Paulist Center in Boston; president of Paulist Productions; and our community's director of formation. During his tenure at Paulist Productions, he was a producer of the 2004 television film "Judas" and the 2009 documentary "The Big Question: A Film About Forgiveness." He also conducts workshops, days of recollection and parish missions centered around forgiveness and the life and ministry of Pope Francis. Fr. Frank is author of the Paulist Press book "Can You Let Go of a Grudge?". In 2017, he composed "A Prayer for Troubled Times" and "A Prayer for the Presidential Inauguration." To learn more about Fr. Frank, you may follow him on Facebook or visit his Pinterest board. Experience Fr. Frank's weekly poems on the scripture readings at Facebook and YouTube. Fr. Frank lives at the Paulist Fathers Motherhouse in New York City. You can write to him at: Fr. Frank Desiderio, C.S.P., 415 West 59th St., New York, NY 10019. You can also listen to this interview on Storycorps.